Provide comfort for the family of Danny Edgar with a meaningful gesture of sympathy. 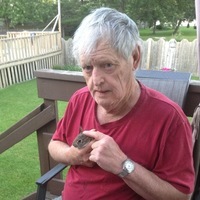 John Danny Bruce Edgar of Petrolia, formerly of New Lowell passed away on Monday, March 25, 2019, surrounded by his family and friends at Victoria, London Health Science Centre. Known to all as Danny, together for almost 50 years Danny and his wife Alverna raised their family, Doug (Amy) and Paula (Rick). Danny has passed on a legacy to his grandchildren, as the much loved “Grumpa Dan” to Makayla, Parker, and Oliver. Danny was very close with his parents and enjoyed the doting love and attention of his mother, Dorothy. Brought up in a very tight-knit family in Baxter, Danny was the middle child of 3 children and will be missed by his siblings Carol (Gary) and Ron. Danny will be missed by his mother-in-law Isabel, in-laws Helen (Jackson), Colleen (Neil), cousins, and his many generations of nieces and nephews. Predeceased by his father Bruce, young nephew Jeffrey and father-in-law Delmer. Always a family man, Danny was very involved in his kids as they grew, whether taking his daughter to work with him or sharing his skills in bowling with his son; a talent that took Danny as far as the Men’s All Ontario finals, winning out with 2nd place. Nothing brought Danny more pride than his children and grandchildren, less than 3 months before his passing Danny was able to hold in his arms his first grandson and namesake, shortly after his birth. Danny was a successful business owner of Edgar Aluminum and A & D Custom Homes and enjoyed his convertibles, hunting, fishing and being involved in the CB Radio Club and local Legion. We encourage you to share your most beloved memories of Danny Edgar here, so that the family and other loved ones can always see it. You can upload cherished photographs, or share your favorite stories, and can even comment on those shared by others. Provide comfort for the family of Danny Edgar by sending flowers. Sending our deepest condolences to you and your family from the New Lowell Legion Branch 516. His comradely and fellowship was always enjoyed.